Like he’s done so many times before, Jordan Williamson trots onto the field on fourth down. The big, bad Trojans, ranked No. 2 in the country at the time, are leading the Cardinal 14-7 as halftime approaches. They’re trying to bring a halt to their three-game skid against Stanford and hand Matt Barkley the elusive victory he’s been searching for his whole collegiate career against the boys from The Farm. Although Williamson had missed a long 47-yarder earlier, this is a 23-yard chip shot that he has made countless times during practice. He gets into position and looks up at the posts before nodding to his holder, senior punter Daniel Zychlinski. The snap is good and the hold is good. But the kick is slightly off and Williamson knows it. He furiously points to the right as he stares at the flight of the ball, hoping that it will drift in that direction. The ball, however, zips just outside the left upright and Williamson throws his hands on his head before jogging off the field as the Trojan offense takes over. Although quarterback Josh Nunes eventually would lead the Cardinal to a huge 21-14 upset victory over USC, Williamson would finish the day with an ugly stat line: 0-of-3 with two misses and a blocked field goal. The broadcasters openly wondered about his confidence and mindset, especially after his rough ending to the 2011 season. 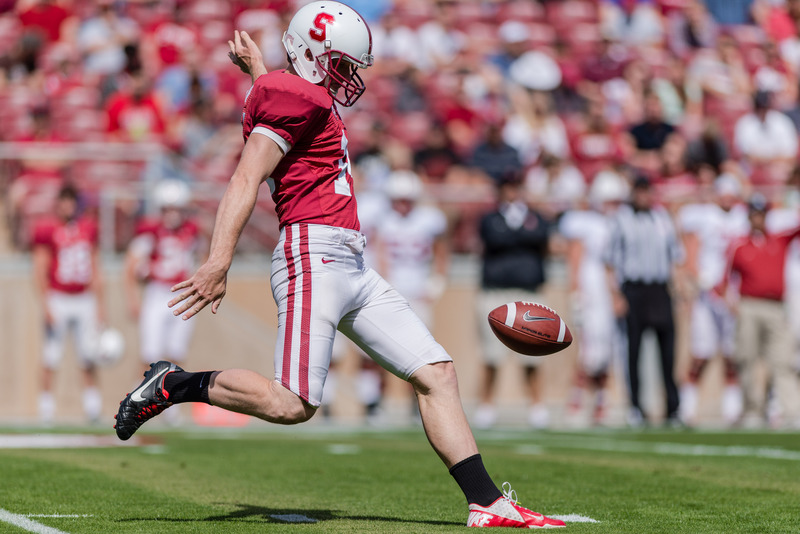 Going into his third year as Stanford’s starting kicker, Jordan Williamson has arguably been through more ups and downs than anybody on the Cardinal roster. He has shown the ability to drill the ball seamlessly through the middle of the goalposts throughout his career with one of the strongest right legs in the country. Unfortunately for Williamson, the media characterized him — as is the case for most kickers around the country — not through his successful kicks, but through those that he missed, openly scrutinizing him and using his shortcomings as the reference point for all future successes and failures. Head coach David Shaw has always stood behind his kicker, asserting on countless occasions that “who [Williamson] can be” is one of the best kickers in the country. And going into this season, Williamson firmly believes that his experiences have left him not with a negative mindset or shaky confidence, but a steadfast belief that they have left him all the better and fully equipped to take on any challenges that may present themselves in the upcoming season. Although he finished just 17-of-27 on field goals last season, he was crucial to the team’s success down the stretch as he not only made the game-winning kick at Oregon, but was also perfect in both the Pac-12 Championship Game and the Rose Bowl to finish the season. He made two field goals in each game and none were insignificant. His game-winner against the Bruins broke a 24-24 tie in the fourth quarter, and his two kicks in the Rose Bowl were the margin of victory in a 20-14 win as the Cardinal offense continually stalled against the Badgers. Stanford will hope that Williamson’s late-season success and his continued work on his alignment to the ball and finish during the offseason with special teams coach Pete Alamar will pay dividends and help Williamson become the deadeye kicker that the whole team has always known that he can be. While Williamson will enter the season as one of the most experienced placekickers in the country, his counterpart at punter, senior Ben Rhyne, will be starting at punter for the first full season of his career. 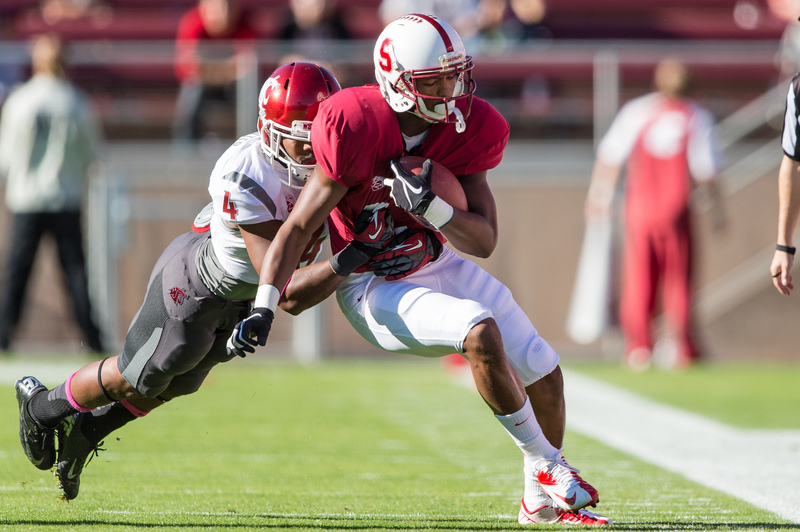 The punting position is so important for a team like Stanford because the physical, run-first offense and the suffocating defense that the Cardinal uses dictate that many close games against other top teams in the country will ultimately boil down to a battle of field position. Departed senior Daniel Zychlinski was huge in that regard last season, averaging over 43 yards per punt and coming up with big punts in close games against Oregon, UCLA, and Wisconsin that gave Stanford the upper hand in field position and propelled the Cardinal to close victories. Although Rhyne filled in for Zychlinski during both games against UCLA in 2012 when the departed senior went down due to injury, the battle for the starting punting position for 2013 was close and hard-fought between Rhyne and sophomore Conrad Ukropina. Ultimately, Rhyne’s superior consistency netted him the starting job. Special teams coach Pete Alamar reported that Rhyne’s punts were more consistent in both direction and hang time in practices. Alamar also stated that Rhyne was more consistent at getting the ball off quickly and was able to produce punts that, even when mishit, would be coverable by the Cardinal special teams unit. Although Rhyne and Williamson will be penciled in as the starting kickers heading into the season, the depth of the kicking squad for the Cardinal is another, less apparent strength. The talented Ukropina, who is effective as both a punter and a placekicker, is a backup who Alamar and the rest of the coaching staff feel is also able to perform at a very high level. The other special teams position battle that was contested during the offseason was that for the punt returner position, vacated by the now-graduated Drew Terrell. The departed senior was outstanding last year, returning 24 punts for 291 yards — an average of just over 12 yards per return. After a long competition between four candidates for the job, sophomore wideout Kodi Whitfield was recently announced as the starter, beating out sophomore Barry J. Sanders and senior wideouts Ty Montgomery and Keanu Nelson. Although Whitfield will be the primary punt returner, head coach David Shaw has not ruled out the possibility of Sanders getting opportunities as well. Sanders was described by Alamar as the most improved by far within the group competing for the job. Montgomery, who was one of many players that returned kickoffs for the Cardinal last year, will return to that position as the primary kickoff returner after averaging over 25 yards per return last year — higher than even what the speedy De’Anthony Thomas of the Oregon Ducks averaged last season. The kickoff return position is also one in which the Cardinal returns a significant amount of talent and depth; along with Montgomery, who handled 10 kickoffs last year, both Kelsey Young and Remound Wright, who returned eight and five respectively, are back. All three averaged over 20 yards per return last year, and although none of them accounted for any return touchdowns last season, all of them possess explosive speed that could prove to be a major asset for the Cardinal in 2013. While special teams is an oft-overlooked personnel group on college teams in favor of hard-hitting linebackers or flashy running backs, make no mistake: Williamson and company are a group on this Cardinal roster. If and when the spotlight shines on Williamson with games on the line this year, every time he’ll be marching out with Rhyne, his holder, without a doubt in his mind that when he kicks the ball, it’ll soar through the uprights and give Cardinal fans everywhere a reason to celebrate. Contact Do-Hyoung Park at dpark027 “at “stanford.edu. Did you know that the result of the 2010 Spring Game was decided by a kicking competition between Nate Whitaker and his younger brother, Eric? Find out who came out on top in “Rags to Roses,” available in the Amazon Kindle store now! Stanford Daily football beat writers Joseph Beyda, George Chen and Sam Fisher interviewed 30 current and former players and coaches to bring you the story of the Cardinal’s resurgence from 2006 to 2012. You can also check out the free excerpts here.